Poland says it will stop a takeover of the country’s second-largest radio station by a group funded by billionaire philantropist George Soros. But Bloomberg reported that hours later, Deputy Culture Minister Pawel Lewandowski told wPolsce.pl television that the government does not have the legal means other than usual anti-monopoly legislation to stop the deal. The Law & Justice party has repeatedly called for a “re-Polonization” of its foreign-owned media, but after an international campaign, the government has shelved plans that could force foreign media owners out. By imposing rules to limit ownership on groups whose cross-platform holdings and market share are deemed “dominant”, foreign media players will be at a disadvantage. Lyudmyla Kozlovska, a young Ukrainian “human rights defender” working for Soros’s Open Dialog Foundation, has worked shoulder-to-shoulder with anti-Polish activists for the cause. Last year, the Polish government deported Kozlovska without any explanation. The likely reason is that she and her Polish husband, Bartosz Kramek, had been instigating riots against the ruling party. Kozlovska admitted that her husband had posted a statement on Facebook calling for civil disobedience. When Kozlovska – who had met with Soros personally – traveled to Brussels, she was turned away at the border because Polish officials had placed an alert in the Schengen Information System (SIS), a shared EU database flagging “unwelcome” foreigners during border control. Kozlovska and Kramek told the Washington Post that they have reason to believe that the Internal Security Agency regards them as a threat to public safety. 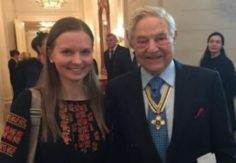 The Office for Foreigners, the Polish government agency responsible for foreigners who reside in the country, declined to comment on this specific case, but Polish officials had already confirmed that they made the alert, labeling her as an agent of George Soros. Kozlovska has been an outspoken protester against Moscow’s inclusion of her former home region of Crimea. The George Soros Open Dialog Foundation called this an “act of political nature carried out by the Polish authorities in order to stop the activities of the organization in the country and abroad”. Polish members of the European Parliament Kosma Zlotowski, Ryszard Antoni Legutko and Ryszard Czarnecki, who represent the Law and Justice (PiS) party, submitted written questions to the European Commission attempting to end the Foundation’s accreditation to the Transparency Register. But all of these have been dismissed by the European institutions as “unfounded” concerns. Pressure from Soros-linked entities have been building on Eastern European countries to adopt an anti-Russian posture. According to the Wall Street Journal, in a meeting with US Ambassador David Cornstein, Hungarian Prime Minister Viktor Orban (pictured) told the American diplomats that he refuses to pressurise China and Russia, and would rather stay neutral like Austria. “Washington pushes for a tougher line on Russia and China, deepening fears that a longtime American ally is drifting from its orbit,” WSJ opined. A senior Hungarian official told WSJ that the prime minister strongly objects to US pressure aimed at curbing the influence of Moscow and Beijing in Europe. “The point for Orban is, yes, we want to do business with Russia,” the senior Hungarian official said. The prime minister also made it clear that he does not want to be lectured about how to deal with China. Lyudmyla Kozlovska is a disgrace to all Ukrainian people of the world – and her husband is a disgrace to Polish people every where. Clearly they are on the take and have no problem being bought and sold – making them both shabbos goy presstitute whores and race traitors who should be executed for treason.